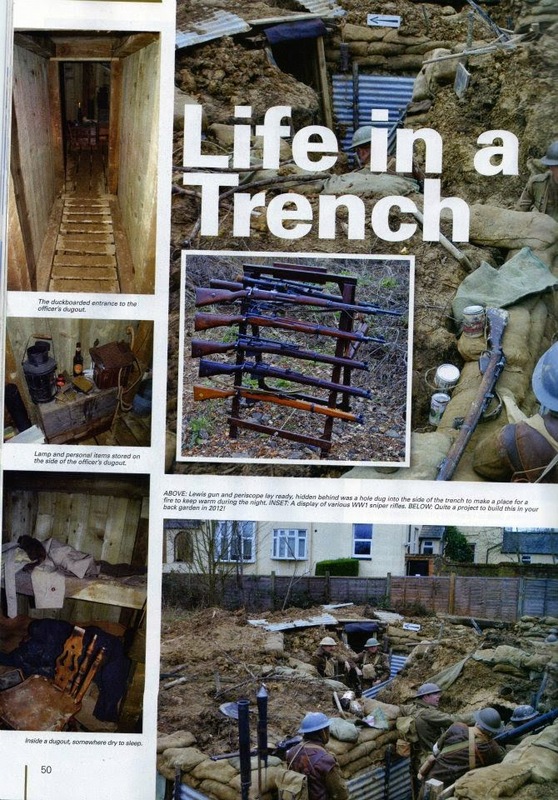 Back in January 2012, I spent a cold 24 hours in a trench and it was for the purposes of a book by Andy Robertshaw, called, unsurprisingly, 24hr Trench. Andy had asked me along to take part in what would be part re-enactment and part photoshoot. 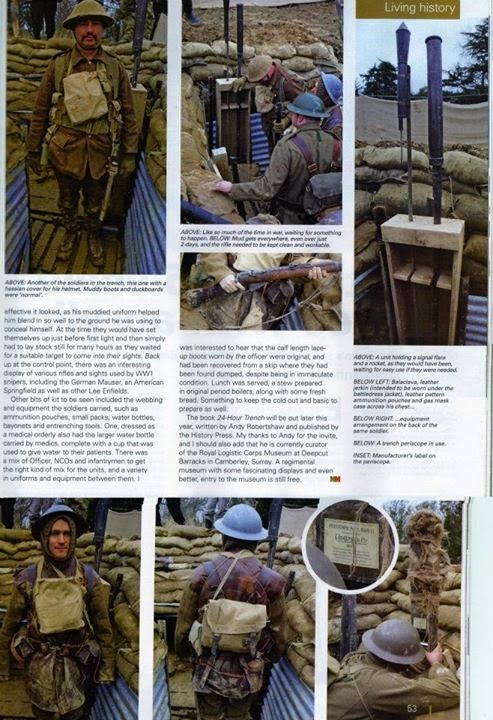 The pictures would end up in the book and we would get to see what it was like spending a cold night in a trench and going through the routines that the average soldier would have in the First World War. 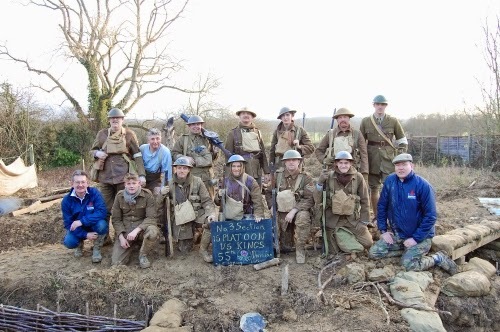 The night we were recreating was one in January 1917 when there was no fighting and a handful of casualties in the unit none of which were from enemy action, but included a man who had fallen down a well! 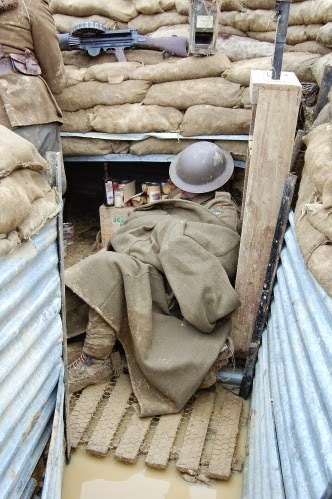 We had to go through the various stages of trench occupation for a front line unit, including stand to, weapons inspection, foot inspection and we ate period food. Thankfully, we had a dry but cold night, although one of the fire bays filled with groundwater, so wasn't very pleasant to occupy! 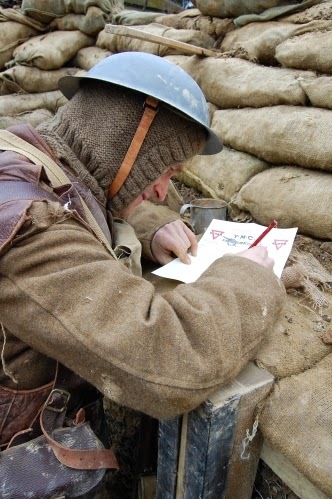 There was also a couple of gas attacks, a lone German assault and we had to write letters home. 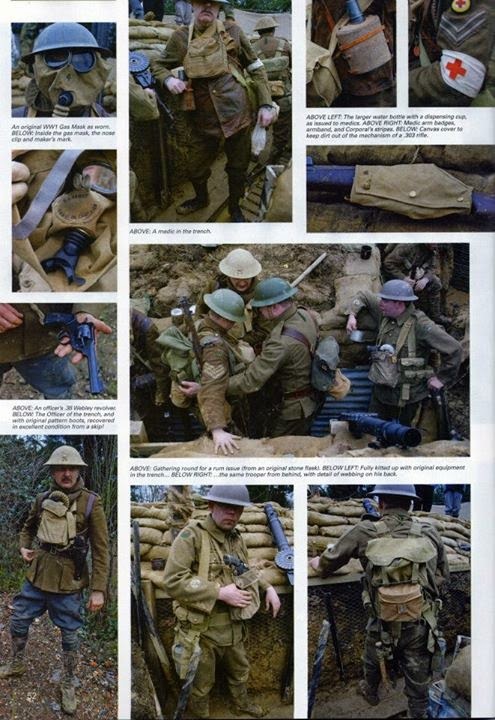 The uniforms were all provided by Andy (who had sourced them from when he worked on Warhorse) and they were surprisingly warm and waterproof. I have decided to post up some photos that a friend took of the event, they can be used as a painting guide! The following photos were taken by Mark Khan, so I thank him for the use of these. First day and that's me in the foreground, I shaved my beard off specially... Besides me is my mate Justin, we passed the time by chatting about music, mostly! 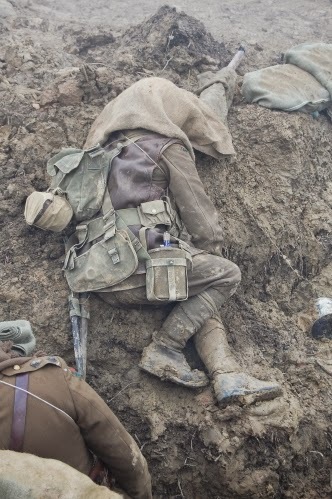 One of the chaps got himself set up as a sniper, it's interesting to see how quickly he blends into the earth. 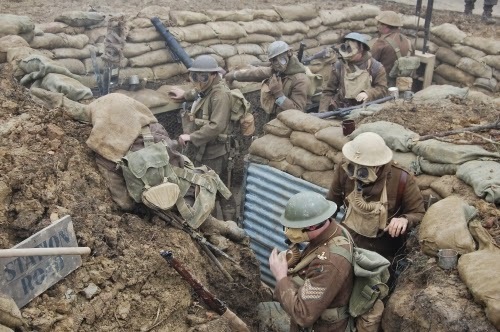 Post gas attack, we kept our masks on until the all clear. It's pretty hard to breathe and even see in those things! Some of the lads, passing the time. Letter writing. 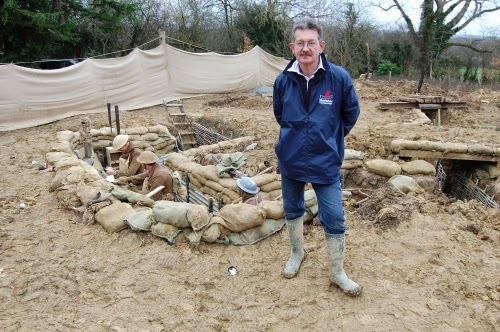 This was a small task which certainly would have helped break up the boredom of trench life and helped with morale. Getting some shut eye. 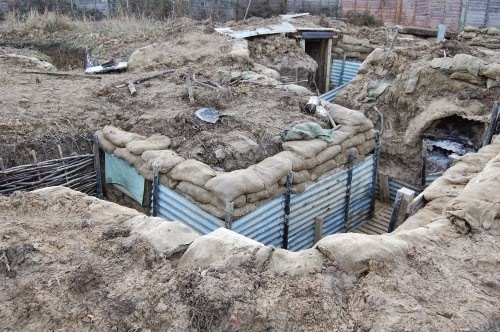 Most soldiers would have tried to sleep in the daytime as work progressed during the night, repairing trenches, putting out more barbed wire, etc would have all be done under the cover of darkness. A good study of Justin, it gives a good indication of the colours of the various bits of uniform including the leather jerkin. And the whole crew, including Andy and Dr David Kenyon, both of whom ran the event. 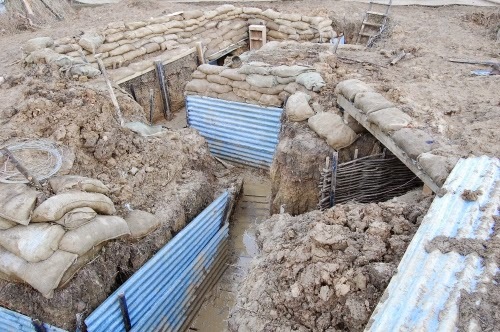 And a few shots of the unoccupied trench, our home for 24 hours! All in all it was an excellent experience and one I would definitely do again. One thing that stayed with me was simply how fatiguing it was, just collecting firewood to cook with was a major task after very little sleep and a lot of kit on.I also learned a lot, like, it was quickly discovered that in order to get things out of your backpack, you needed a mate to fish around in there for you and you would then help him. 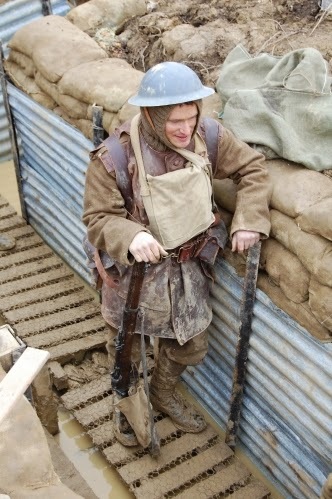 Andy runs trench experiences, so if you get a chance, try spending a night in a replica trench! Great pics, thanks for sharing the experience. Thanks Stanley, it really was an experience. I was so glad I said 'yes' when asked! Superb, rather envious of you truth be told. 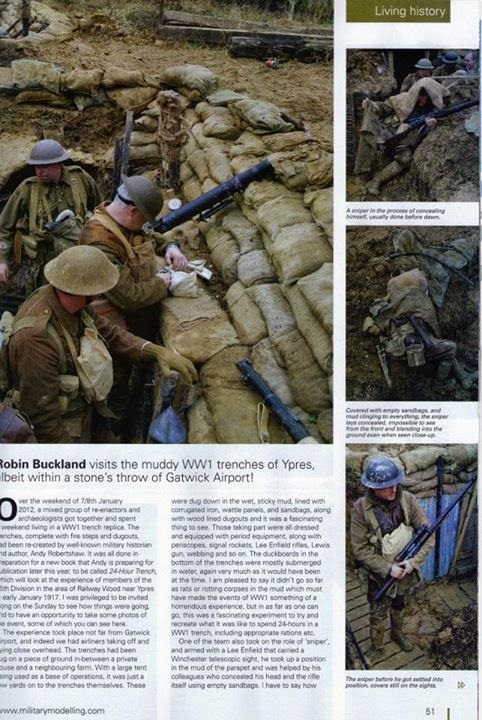 Thanks Pete, Andy runs trench experiences, so you could get to do the same! Great looking moments, thanks for sharing! Thanks Phil, it certainly was great! Truly an unusual but rewarding and eye-opening experience! Imagine a month! Thanks Troy, I think Andy was next planning on doing a few days in the front line. 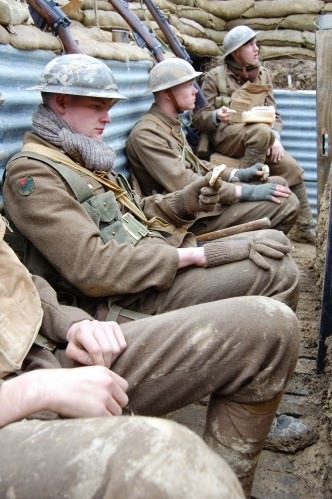 In the war Soldiers were rarely in the front lines for more than four days on average! 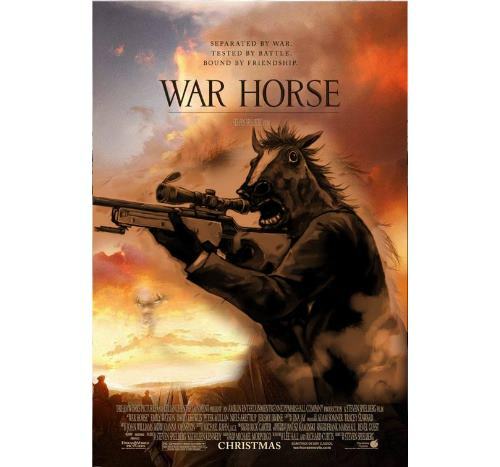 This was terrifically interesting and I agree with Pete, rather envy-inspiring. One thing I was surprised by was the reference to gathering firewood. 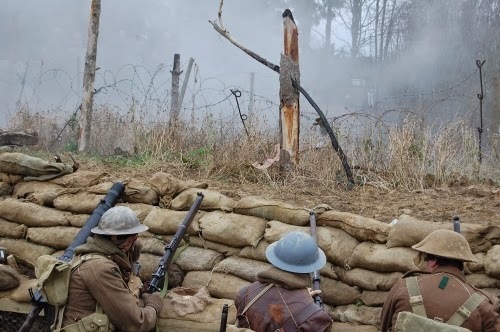 I wouldn't have thought fires would be allowed in frontline trenches, buy maybe in back areas or dugouts? That would have been a chore, considering how rare wood was and how it was needed for other uses (shoring, duckboards, etc). I did some American Civil War reenacting in wintertime and learned, as any modern soldier knows, that functioning in the wintertime is challenging. 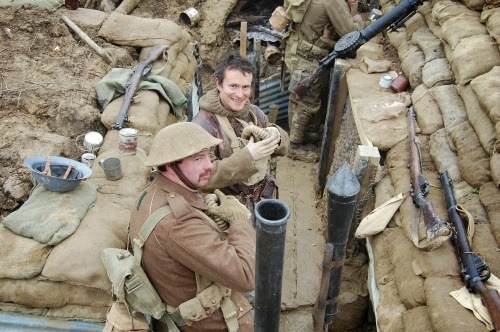 And yes, having a mate help you with your kit is certainly the way to go. Thanks Michael, we gathered the wood in the middle of the night, just to keep us warm rather than for historical accuracy! However, the fire was covered, so the enemy wouldn't have seen us! Yep, I don't think fires were actually allowed close to the enemy, but wooden duckboards and shoring would have been built either in the UK or way behind the lines, so would have been in plentiful supply. The trees on the frontlines were too smashed up to be of any use for building, on the whole.